On the 70th anniversary of the Hungarian Holocaust, OSA Archivum remembers a tragic and shameful chapter of Budapest's past by exploring the history of the “yellow-star” houses. Our English-language Yellow-Star Houses website is now live. Since the launch in late January of the Hungarian sister website, we have received around 100 stories and documents from individuals who lived in the houses, or their descendents. 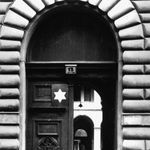 By midnight on June 21, 1944, all 220,000 Hungarian citizens in Budapest who were legally defined as Jewish, and who had to wear the yellow star on their clothing, were obliged to move into one of almost 2,000 designated "yellow-star" houses throughout the city. This network of yellow-star houses was intended as a preparatory stage for deportation. It was established by Budapest mayoral decree, and was unique in the history of the Holocaust in Europe. Our interactive map shows the location of the former yellow-star houses, and what the remaining 1,600 houses look like today. The map is supplemented with numerous documents, including the relevant decrees, a list of houses, a chronology, and a glossary. Using the navigation tools, visitors to the site can view the former yellow-star houses at street, district, and even city level. Over the coming year, our hope is that these resources will continue to expand. We want to encourage everyone to submit their documents and personal stories concerning the yellow-star houses and the families who lived there. On June 21, 2014, we will organize a memorial event in front of the roughly 1,600 buildings, former “yellow-star houses,” that still exist. We invite you to join us as a participant or volunteer organizer to face this neglected chapter of our shared past together, and with dignity and honor. The website is part of a year-long series of public programs focusing on Budapest 1944, which will culminate in December 2014 with an exhibition at OSA on the Budapest ghetto.